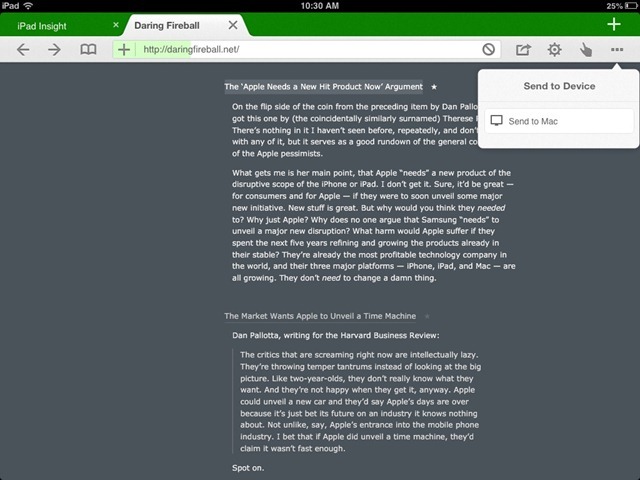 — Save to Evernote – with just a couple taps. So useful for those of us who use Evernote as a catch-all notes storage. — Dolphin Connect: Lets you send web pages, tabs, images and more from iPad to desktop browser and vice-versa (with appropriate extensions installed on Chrome, Firefox or Safari). This is just so slick to use. Dolphin Browser is easily the best alternative browser for the iPad that I’ve seen. This update makes it even better. Of course it’s on our list of Best iPad Apps of 2012. I really wish Apple would let us set our default browser on the iPad, and I imagine that has to be coming in the not-too-distant future. As soon as they do, Dolphin Browser will be mine. Here’s an App Store link for Dolphin Browser for iPad.